Tovi and his friends want to get out of the rain. Smart penguins. The decision to go to London does not get them out of the rain, but it does take them on another adventure. 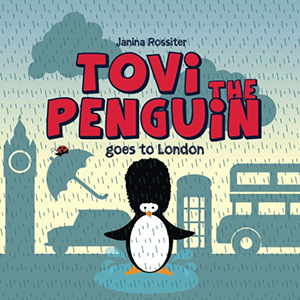 Janina Rossiter, does a fantastic job as the author and illustrator of Tovi, the Penguin Goes to London. The illustrations are so indicative of “foggy London town” with its gray and blue colors. The written depiction of the rain and the places and things they see paint a picture perfect for a young child’s mind. The two things combine to put your child into the Tovi and friends adventure with her descriptions and her great illustrations of the well-known places from the red bus to the Tower Bridge. Children will love to pour (pun intended) through the pages looking for so many wonderful discoveries – especially the little ladybug who accompanies them on their trip. You will love the look of delight on your children’s face as they discover more and more exciting things on each page, from the always present ladybug to the little earthworm. Learning about a new city is not the only experience that Ms. Rossiter has in store for her excited readers – they also learn about the culture (transportation, tea, a little history and friendship. Another satisfying ending to another great book in the series. Janina Rossiter loves three things: design, France and her little family. She has lived in Germany, England and now France. From her background in design and illustration and the arrival of her daughter, the natural progression was to become an illustrator and writer for children. Be sure to watch her, she will become a force in children’s literature. Janina Rossiter has written and illustrated a new book about Tovi the Penguin. It is a lovely Christmas story that you must read to your children. They learn that Christmas is not about getting a lot of presents, but about love and being with family and friends. Tovi and his friends go on a Christmas trip, but a disaster happens – there is a storm and Santa can’t find them. They figure out a way to celebrate anyway. How the friends turn this adversity into a wonderful celebration is so very heartwarming and resourceful. Children and adults alike can find comfort and satisfaction in how the penguin friends celebrate Christmas without getting presents. The end of the story is going to make you cry and laugh with joy – it did me. The brightly colored pictures are exactly illustrative of the story and children will love pore over them and imagine their own story. Good illustrations are a great way to encourage a child’s imagination and Ms. Rossiter does it beautifully. Janina Rossiter studied Communication design in Hamburg, Germany then Janina worked as a packaging designer in both Germany and England. She then settled down as a freelance designer in Paris, where she currently lives with her husband and her young daughter, Malyn. She began illustrating and writing her books as a result of the arrival of her daughter. 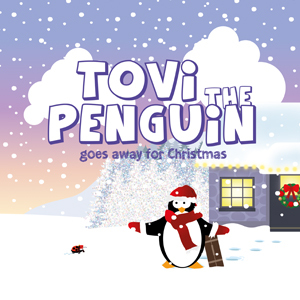 Soon, Tovi the Penguin was born and is now inspiring children all over the world. Be sure to check out her other books about Tovi and his friends. Watch her website www.tovithepenguin.com for adventures about Tovi and his friends.